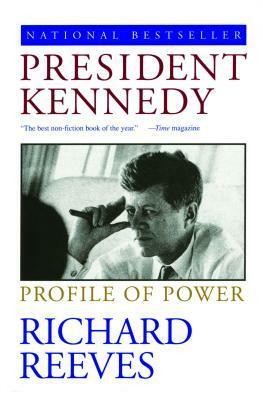 “President Kennedy: Profile of Power” by Richard Reeves was published in 1993. Reeves is a former journalist, syndicated columnist and the author of about a dozen books. He has served as Chief Political Correspondent for The New York Times, as National Editor and Columnist for New York Magazine and Esquire and was Chief Correspondent for PBS’s “Frontline.” He is currently Senior Lecturer at the Annenberg School of Communication & Journalism at USC. The first things readers of “Profile of Power” will discover is that it is neither a conventional biography of John F. Kennedy nor a traditional review of his presidency. Instead, it is a lengthy but free-flowing account of his three years in office, not from the point of view of a historian but from Kennedy’s own perspective. During its 662 pages the reader follows Kennedy almost day-to-day (and sometimes moment-to-moment) through his presidency – observing the rush of events through Kennedy’s eyes, from his inauguration up to (but not including) his assassination. Reeves’s approach largely steers clear of sensational revelations about Kennedy’s childhood, his precarious health, his notorious womanizing and the various efforts to hide his menagerie of flaws. But while the author does not seek to obliterate the Camelot facade he also avoids portraying Kennedy as a deep-thinking intellectual. Instead, the man who emerges is a calculating politician whose shenanigans are never entirely ignored…but readers see far less of Judith Campbell and Marilyn Monroe than of the policy debates among Kennedy’s political inner-circle. The book opens with a chapter introducing Kennedy: his public persona, something of his inner self and the circumstances which catalyzed the author to put pen to paper. Its fifty-six chapters proceed chronologically and Reeves intentionally avoids presenting subjects thematically (the chapter titles are actually specific dates). Instead, topics are examined as they occurred, often simultaneously and in competition for Kennedy’s time and attention, including Laos, the Bay of Pigs, Vietnam, Berlin, the arms and space races and civil rights. Reeves’s approach offers several advantages. His behind-the-scenes glimpses of the planning, debating, surveying, worrying and second-guessing are uniquely revealing and enormously fascinating. And in many cases his presentation style lends itself to clearer explanations of complex situations than is usually the case. This is particularly true of the Bay of Pigs and Berlin if not as much for the quagmire in Southeast Asia. The text provides a solid introduction to Kennedy and his perspectives (public and private) regarding the civil rights movement, and Reeves’s account of JFK’s initial meeting with Khrushchev will captivate almost anyone. The author’s writing style provides a compelling level of engagement between the reader and Kennedy’s times and provides a deep hint of what it might be like to actually be president during fractious times. Missing from the narrative, however, is sufficient color relating to Jackie Kennedy, JFK’s parents or siblings (other than Robert who, as Attorney General, seems omnipresent) or his friends and colleagues who failed to earn key posts in his administration. Far more disappointing, though, is the notable lack of analysis or conclusions throughout the text. Reeves clearly knows Kennedy well and it is unfortunate that an author so adept at extracting insight from his sources wasn’t willing to share more of his own thoughts. Overall, Richard Reeves’s “President Kennedy: Profile of Power” is a welcome supplement to the vast body of more traditional Kennedy-focused literature. This book is not appropriate for someone looking for a comprehensive introduction to JFK, or for scholars seeking a rigorous exploration of his presidency. But for anyone hoping to build upon an existing understanding of this intriguing yet enigmatic president, Reeves’s book proves a compelling choice. Of the JFK [non- assassination } books this is probably my favorite. He’s also done similar books on Nixon and Reagan… From what I have read the ultimate JFK story has not been written- yet. I have this volume as the one I plan to read JFK. I’m not particularly a fan, so have I chosen a good one to read? If this would be your *only* book on JFK I enthusiastically recommend swapping it for Dallek’s “An Unfinished Life” which, for an extra 50 pages, will give you a much broader and equally colorful look at Kennedy. Dallek doesn’t give you the same sense you’re following Kennedy through each day of his presidency but in every other category I think Dallek comes up the winner. Still, if you don’t mind missing out on all the “context setting” re: JFK’s pre-presidency this one won’t disappoint. Surprised you didn’t like it more! I thought it was a great one. In terms of pure drama and entertainment it’s darn near a “5” but my rating system gives equal weight to the book as a “biography” and providing “teachable moments” which usually implies a bit more analysis than Reeves offered. I have to admit…I read it at the beach and although not a typical “beach read” at times it was hard to put down! Thank you for your review, this is now on my to read list!